AN URGENT call from a client used to send engineer Ho See Fong scurrying back to the office at night to access information. With his company's move onto a cloud server last year, he can now do the same from home. That means dinner with his wife, before logging on to attend to his clients' queries. Perhaps the biggest change of all: the 37-year-old will become a dad soon, though he laughs off any link between impending fatherhood and his firm's use of technology. 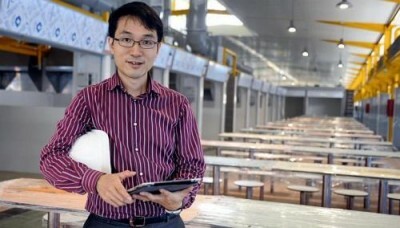 His engineering consultancy company, HY Mechanical and Electrical, invested in iPads for its 22 staff. It plans to recover the costs by applying to a government productivity fund. Advances in technology infrastructure mean the cost of moving onto a cloud-based system by SingTel is less than the traditional e-mail system they used to maintain. Even payroll and accounting systems can be put securely on the cloud. Google and SingTel say such tools allow employees to be freed from the office and to access their work from anywhere. In Mr Ho's case, as long as he has an iPad with him, he can directly update mechanical and electrical engineering plans from construction sites and at client meetings, without needing to go back to the office. Simpler tools exist. Google shares that its free applications include an online calendar where a person can set limits on his working hours - those who try to book a meeting outside those hours will get a warning message. Its Hangouts application allows multiple-user video-conferencing. Not only is this used for meetings, Google has found that many employees working out of the office use it as a social tool to stay connected with their teammates. But technology can be both a blessing and curse, says Randstad's managing director for Asia- Pacific Deb Loveridge. The HR services company found that seven in 10 Singaporeans receive calls or e-mails outside regular office hours, and 67 per cent do so when on annual leave. Half of all employees say their bosses expect them to be contactable at all times. "They should talk to their employer to set clear expectations of what work needs to infringe on family and personal time."